On October 15, as a dusky autumn day melted into a chilly evening, Tariq Ahmad was gleefully playing with his kids in his modest home at Newa (Pulwama). As the wall clock struck 7:50 PM, a loud bang was heard outside. Located barely 100-meters away, it was CRPF’s 183 battalion that came under attack by suspected militants using rifle grenade. Although the neighbourhood wasn’t surprised because the garrison was attacked several times in the recent past, this proved different. Shortly, the dead silence of the night was again rattled, with gunshots now. While the family was still assessing what was happening outside, a volley of bullets fired from the camp tore through Traiq’s living room window and hit the wall. Crackling sounds of smashing windowpanes mixed with the raging sound of gunfire ruled the air. The joyful aura of baby chuckles gradually dissolved into a dreadful silence. The soldiers were returning the militant gunfire but the locals say that their homes were deliberately targeted as the militants had carried the hit-and-run attack. The scenes at the neighbouring houses were no different. 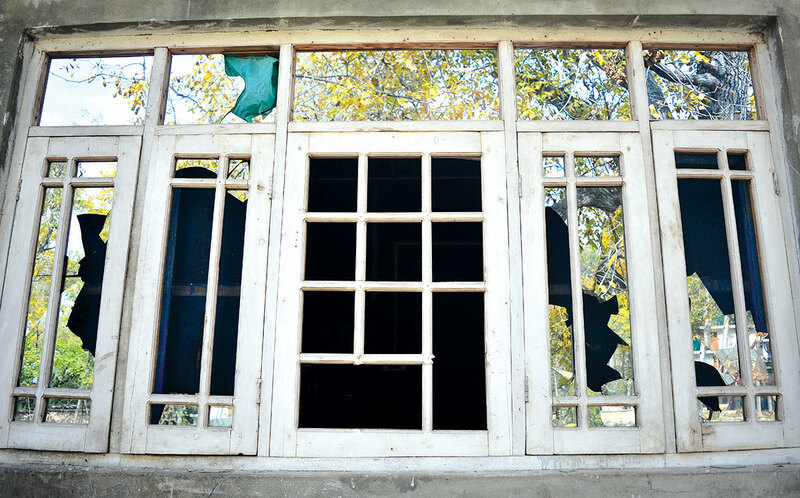 Right next to Ahmad’s house, a 3-storey structure with shattered window panes and bullet holes scattered all over its front side is a telling testimony of the happenings. A car with no window intact is parked on one side of the courtyard. Following a trail of bullet holes on the living room wall of the house, the daughter of the owner, Raziya, almost had an emotional breakdown. She counted the bullet marks with her left index finger and whispered to herself – “Eight”! In the aftermath, around a dozen families, including the above two, packed their household belongings and left the locality a few days later. The families say they have been forced to live like migrants in their own land and Government is totally tight-lipped about the issue. The locality bears a desolated look with most of the homes locked and streets deserted. The residents occasionally return to their homes during the day and leave as soon as evening darkness starts to creep in. Some of them are still so terrified that they haven’t dared to come back even once. Happy neighbours just a month before, the families are now scattered in and around the village, most of them living a life of penury. Some families are living with their relatives who were kind enough to offer them shelter while as some have rented rooms away from the area. With harsh winter just around the corner, the destitute families see no end to their miseries in immediate future. The only demand the displaced families are making is to either provide them land somewhere else or to shift the army camp to another place. This situation is fuelling the already mounting anger and alienation. With ever encounters between militants and the counter-insurgent forces, civilians are finding themselves caught in a deadly quagmire. Somewhere in the complexities and nuances of this war, the line between combatants and non-combatants is vanishing slowly. “We hold no weapons or stones for that matter, then why are we their target? Through these kinds of tactics, they are pushing us towards the gun. If things remain like this, we have no other option left. They are going to kill us either way,” an elderly resident sitting on the edge of his paddy field said angrily. In Trichal, only 3 days after the Newa incident, a dozen people including two women were badly injured after the army allegedly went berserk when seven soldiers were injured in an IED blast. 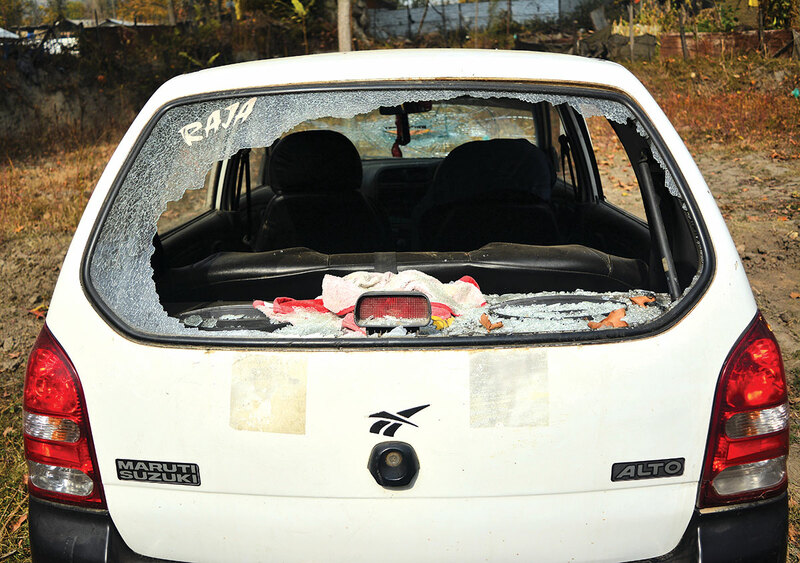 The residents said that the army beat civilians and vandalized public property worth lakhs. After the incident, some of the residents started contemplating the option of migrating from the area but one hurdle or the other kept changing their mind. While some say that they cannot leave the earnings of their life behind, others are financially unsound for a shift.